The revelations on Mars -- a half-million year-old legacy of the vanished star-traveling Builders -- have fed the flames of catastrophic war. A beleaguered United States and its Russian and Japanese allies struggle to hold their own against the indomitable forces of the enemy United Nations. The bloody conflict that has swept over the home planet now rages across the blackness of space -- with the U.S. Marine Corps in the vanguard, leading the charge as always. But Mars is not the sole repository of alien wonders. The Earth's moon hides unsettling mysteries of its own-and dangerous secrets pointing toward an unstoppable threat advancing from somewhere beyond the solar system. And as scientists on both sides ract to utilize technology they have only barely begun to comprehend, the UN makes the opening move in a gambit that could end the hostilities quickly and decisively by bringing about the death of millions...without the aid of alien-inspired weaponry. A bad situation worsens by the nanosecond. 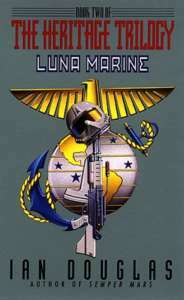 And that means it's time to call in the Marines -- to make a life or death stand on the gray shores of Luna.